The plan for day 3 was to hit a few diners, drive-ins and dives in Nashville. The breakfast plan was Athens family restaurant which was the only DDD open for breakfast. Guy’s visit focused more on the traditional greek entrees but I find breakfast still gives you a good idea of a restaurant as a whole. 1. Blue and white decor in an otherwise sterile environment. 2. An aged sign with character including missing letters on the letter board. 2. A moderately pleasant waitress with an accent. 4. A spattering of regulars sucking back copious amounts of coffee while reading the newspaper. 5. A reminder that Greece is not known for coffee. Since we arrived prior to 10am, the choices were limited to breakfast which was a bit of blessing given the huge amount of choice. The downside was an inability to try any of the traditional dishes that attracted Guy here in the first place. That said, I believe the ability to execute a terrific breakfast is indicative of the rest of the menu, especially when ordering the Achilles’ (pardon the pun) heel of many morning joints; eggs Benedict. Perfect poached eggs with tangy and creamy hollandaise atop ample meat is an art. My two daughters had a case of “I lack any sort of ambition prior to high noon”, so they opted for a simple breakfast special. None had a particularly exciting presentation but was reflective of the restaurant’s concept in general. After all, not everybody garnishes their dishes at home with parsley sprigs or drizzled sauces in shape of the Parthenon. The Eggs Benedict ($12) was delicious. Nicely cooked poached eggs sat atop a thick slice of in-house smoked ham. 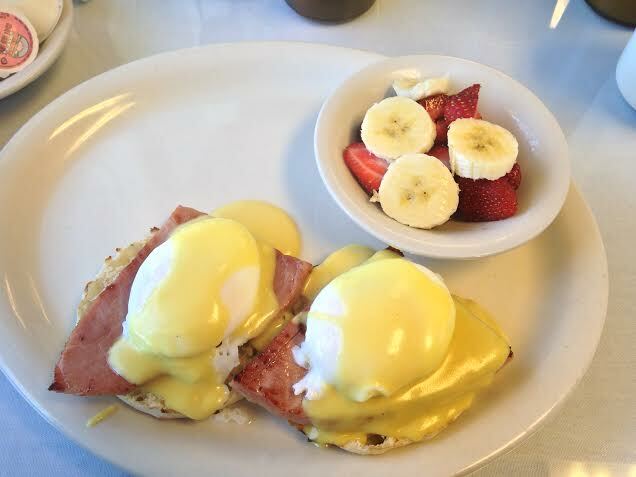 The Hollandaise sauce was delicate and flavorful. I ordered it with fruit and was reminded that strawberries are delicious when they don’t have to travel clear across a continent to get to your table. It wasn’t the prettiest plate but was quite easy to devour. 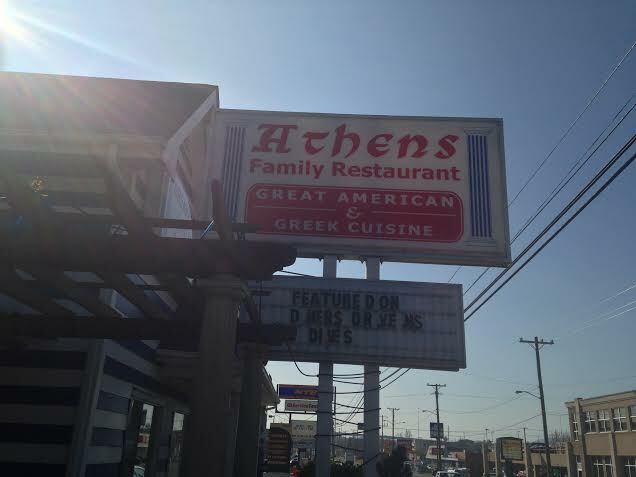 Athens’ is stereotypical greek family restaurant. I can only comment on breakfast but it was a tasty way to start a day in Nashville. The breakfast specials were a good value (around $6 each). Predictably, the coffee was bad and food was good. It lacks any significant vibe but they don’t claim they have one either. It’s a pleasant boring. Hmmmm…sounds like a Russell Brand movie. Afterwards, I embarked on a walking tour on the two most expensive universities in Tennessee. Vanderbilt tops $40000 per year while Belmont comes in a little under $30000. Both campuses were beautiful. They are also very big. My daughters were less than impressed with the half marathon I brought them on. The advantage was I was able to work up an appetite to tackle Arnold’s country kitchen, one of the most iconic eateries in Nashville. 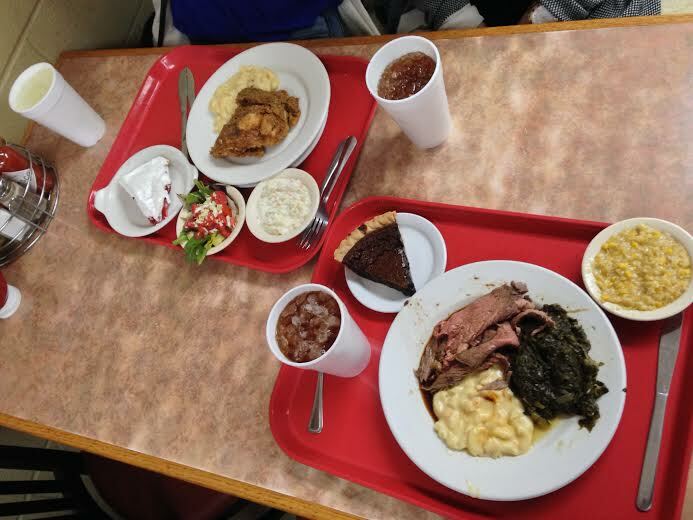 Promising one of the best “meat and three” meals in Tennessee, Arnold’s offers authentic southern food at decent prices. Normally I attempt to avoid lunch rushes, but I didn’t want to test my luck against two mercurial teenage girls. As expected, the place was packed. The diversity of patrons ranged from young children to business professionals. As I stood in line I noticed the James Beard medals and numerous celebrity endorsements which lined the walls. Despite the length of the line, things moved quickly and we had food on our trays within 15 minutes. For me, it was roast beef, creamed corn, mac and cheese and turnip greens. The girls split fried chicken, green salad, cole slaw and mac and cheese. For dessert, we had spicy chocolate and strawberry pie respectively. With drinks (ice tea of course), the final tally was less than $30. To this my daughter’s comment was the fact that the entire meal was the same price as the plate of southern vegetables at Husk the night before. I see an economics major in somebody’s future. What $30 gets you at Arnold’s Country Kitchen. Simply put, this place is worth the hype. Each component of the meal was among the best I’ve had. The roast beef was a perfect medium rare. The mac and cheese and creamed corn were like a young hollywood starlet: rich but not overly heavy. The bitterness of the tender greens were evident but dulled by vibrant seasoning, creating a perfect balance. The chocolate pie was divine; the bittersweet of the chocolate combined with the subtle heat of the peppers created a trinity of taste sensations more divine that of a French or Louisiana mirepoix. The girls’ fired chicken was equally fantastic. 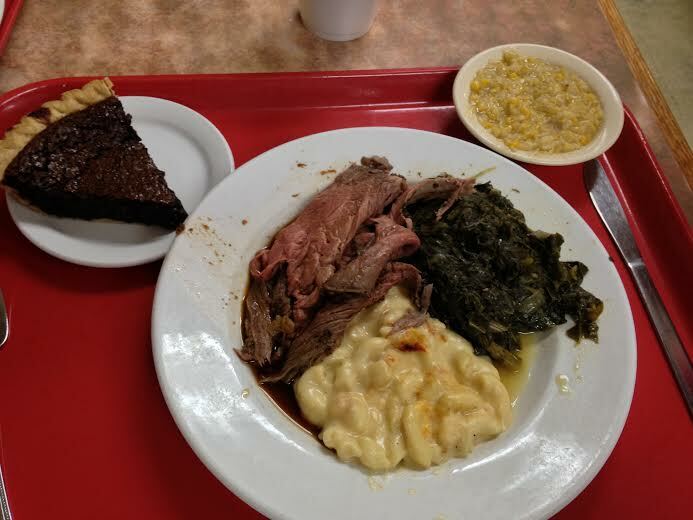 Roast Beef, Mac and Cheese, Turnip Greens, Creamed Corn and Hot Pepper Chocolate Pie. There is always the fear that restaurants with as much hype as Arnold’s country kitchen will be a let down. From the first bite it was evident that the medals, endorsements and accolades were all well deserved. Tender roast beef, fried chicken that could easily be the envy of Colonel Sanders and his army of Kentuckians, delicious sides and incredible desserts highlight a simple and authentic southern menu. I understand why they call it soul food…because eats like these hit some kind of sensory receptors on the soul itself. I honestly pondered getting in line again for another round but after two university campus tours and a rather lengthy walk downtown, the anticipated angst of my two daughters outweighed my desire for a collective meat and six. The afternoon involved driving west down the music highway to Memphis but not before a stop at Bro’s Cajun cuisine on the way out. It took me a few tries to find it. Perched up a hill on Charlotte street, the best identifier is a white boat in a parking lot with the name of the restaurant written in red across the side. After a small jaunt up the hill, I walked into the place. The interior was a cross between a beach house, a bus station and a butcher shop. We were quickly greeted by a trio of characters I later identified as the chef, the waitress and some dude who hangs out like Norm Peterson or a similar sitcom character. We ordered takeout and had a seat at a table while waiting. Norm started up a conversation which included but was not limited to “Where y’all from?” “Is it cold in Canada? I heard it’s nice up there!” and “Make sure you put a tack on the map board over there.” Shortly after he got scolded by the waitress for not doing anything to help around the restaurant. When I mentioned we were on our way to Memphis and asked what’s fun to do there, her response was “Well, I don’t know. I’ve never been to Memphis”. 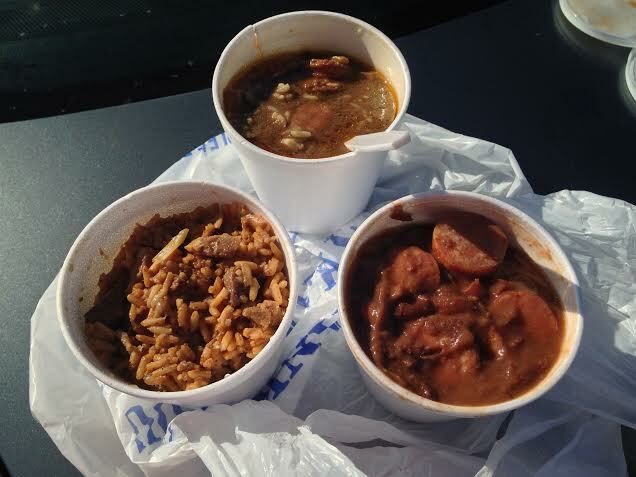 I order a triad of Cajun mainstays; gumbo, rice and beans and jambalaya. In all three dishes, the sausage was the dominant player. Although this created a bit of monotony throughout the meal, in the end the dishes delivered on the promise of bold flavours. Since I haven’t been to Louisiana, I can’t comment on the authenticity but I imagine given what I know about Cajun cooking it would safe to say it’s a true representation. The prices were fantastic and the portions were huge. For those who can’t make it to Louisiana, I’m confident that Bro’s would be an adequate fill-in for a Cajun craving. The food is delicious although a little monotonous. When you enter, you feel like family but maybe too much so as you thrown into a bit of a sitcom situation and can’t help wondering if there’s a camera running somewhere. I mean, would it really be out of the question? A Louisiana clan moves north to Tennessee to make it big in Music city by converting people from fried chicken to gumbo. Maybe they would call it “Bro Goes Country” or “North of 35”. So, it was off to Memphis for a little Elvis, blues and more culinary quests, of course.